Over centuries of migration and travel, humans developed routes that guided them along the most direct lines of travel from one pool or stream of potable water to the next. Native Americans exploited scarce natural resources when they became available. If the salmon were running, people gathered at places where salmon might easily be caught, such as at the Horn on the Yakima River, or at Celilo Falls on the Columbia. If berries were ripening in the high mountains, people headed for huckleberry patches like those around Mount Adams. When game was rich with nutrients as winter approached, people camped on the upper reaches of the rivers where they would find the highland elk or deer descending to take shelter in the lowlands for the winter. And when all possible foodstuff had been gathered, Native Americans sought likely places to spend the winter: places sheltered from the wind, blessed with the least number of snow storms, and heated by the feeble rays of the winter sun. Their camps for the winter tended to be located at the base of south-facing cliffs that would absorb the heat of the sun during the day, and then release that heat during the lengthy night. In Kamiakin, Andrew Jackson Splawn locates the winter camp of Chief Moses of the Sinkiuse eight miles away from the mouth of Crab Creek where it emptied into the Columbia. Splawn knew Moses personally, having begun running cattle across Central Washington in the 1850s. Sure enough, when you clock eight miles on your odometer as you head up Crab Creek from the Columbia, you’ll eventually find a likely place for a winter camp. There aren’t all that many south facing cliffs, but the land is sandy and it was at this point that Crab Creek used to disappear beneath the sand on its route to the Columbia. Today there is a Fish and Wildlife access area located at the site. The sand is littered with glimmering shards of flint and chert from the looming cliffs of Saddle Mountain to the south. The sources of this rock, that provided weapons and tools for the Sinkiuse, were veins in the basalt the was exposed by the furious floodwaters of the Ice Age. There were other resources that also drew the Native Americans. A ragged weed that still grows in the area provided a fiber that was used for making intricate decorated baskets. These fields of Indian Hemp were so productive that competing tribes might go to war over their exploitation. Opposite the site of Moses’s winter camp, at the very base of Saddle Mountain, Native Americans located (and taught the pioneer white settlers about) a fissure in the talus slope where cold air blasted forth. Inside, at the height of summer, there was ice. I don’t know for sure how the Ice Age was created, but my father once speculated that it was formed during the Missoula Floods, when a massive iceberg collided with the eroding northern slopes of Saddle Mountain and was trapped beneath a landslide. For thousands of years the ice remained trapped, a natural refrigerator in the perpetual shadow beneath the north slope of the mountain. When the Milwaukee Road was built, the Ice Cave was used to preserve meat, probably much the same way it was used by Moses’s people earlier. But the builders of the railroad built a wooden doorway to lock up the cave, hoping to keep robbers from taking their supplies. Today remains of that doorway can be seen at the base of the massive rockslide that plunged down on top of the cave. The slide destroyed access to the interior of the cave. Perhaps A. J. Splawn was mistaken: given the access to mineral resources, hemp fields and the Ice Cave, not to mention the ample salmon runs that could be exploited in the rapids of Saddle Gap, Moses’s people might have used this site all year round, not just as a winter camp. Seattle’s Burke Museum once had an exhibition about Plateau Indian culture in which they reconstructed a life-sized lodge such as the Wanapum and Sinkiuse people used. After visiting the exhibit I found the footprint of just such a structure within a half mile of the homestead, a few steps away from Crab Creek. With its location in a sheltered valley by the creek, at the base of a south-facing cliff, this site might have been used as a winter lodge. A circular pit sat beside the oblong lodge. It might have been an even older lodge, predating the oblong style, or perhaps it was a sweat lodge or some other structure peripheral to the main lodge. When I next visited a university library I did some research to see if anybody had located this lodge, and found that it had recently been recorded by an archaeologist who did a survey of the area. It is easy for us to forget that Native American peoples didn’t have horses. When they had to move from one place to another before Columbus, they were stuck doing it on shank’s mare. It’s pretty clear that migration or travel routes would have to be developed that respect the human limitations of the trip. So it isn’t surprising to note that ancient trails can be traced that lead from the Columbia River at White Bluffs to the crossing of Lower Crab Creek, which would be the most direct route from one water source to another. My father has to take the credit for pointing out how to identify old trails. Maybe it’s because I had so little to do for entertainment when I was growing up on a farm west of Othello in the 1960s, but I began to take an interest in what was visible in the landscape around me. My dad used to chuckle whenever he watched western movies and they’d show a roadway with a center strip: that was typical of roads only after the automobile was invented. Before that, a horse would walk down the center of the road, and if it pulled a wagon, the wheels wore away at the sides of the road. So an older roadway was U-shaped, without a center strip. As I roamed the slopes of Saddle Mountain and the flats on Lower Crab Creek, I began to recognize these signs. The dim traces of an ancient trail, identified by the U-shaped rut and the line of grass growing in it, leads towards Saddle Mountain's Low Gap, south of Crab Creek. Of course even before the horse, people used these routes. What did their trails look like? For one thing, their trails led directly as possible from one water source to another. In the area where I grew up, that meant from White Bluffs on the Columbia to the banks of Lower Crab Creek. Without horses, people formed the trails with their own feet, and usually in a single file line. So their trails were narrow ditches that drove directly from the easiest routes of passage from one water hole to another. There is a place just inside the Columbia National Wildlife Refuge that displays a history of human transportation. I discovered this as a youth, and it’s now off-limits to the regular human being. As you travel west on Highway 26 from Othello, you reach a spot about eight miles out where the highway drops off a plateau onto the creek bottom. There is an access gate to the refuge where a road leads off to the north. A few hundred yards north of the gate (on inaccessible land today), the modern gravel road parallels a wagon road and a foot trail, relics of three stages of human transportation. All three routes head for the same point, the crossing of Lower Crab Creek. This crossing wasn’t necessarily the best place to cross the creek. The creek itself might vary in depth or force of flow depending on the year and the weather. But this location was in line with the old Indian trails that led from the Columbia River near White Bluffs, over the lowest portion of Saddle Mountain (although my father always called this feature Low Gap, the map I refer to later bestows that name on an entirely different place, so to avoid confusion, I am referring to this pass as the low pass) and towards the reliable waters of the Grand Coulee to the north. Plus there were a number of natural lakes and Crab Creek itself that might provide water. By the 1930s a bridge had been constructed over Crab Creek, allowing passage by horse and wagon or automobile. The crossing of Crab Creek on the old trail to the north was located at a particularly important place: it was about a day’s travel on foot from the banks of the Columbia River. That meant that it would have been a convenient campground for travelers using the trail. When I was in the Boy Scouts we camped at the same spot, years ago. After the arrival of the horse in the late 1700s, Plateau Indians began using the trails to travel northward on trails formerly followed on foot. In their seasonal rounds the Indians developed the habit of riding north on horseback, then using canoes to descend the Columbia on their way back south. The earliest fur traders in the northwest record their dealings with the Indians as they sought to purchase horses for their northbound expeditions. Ross Cox’s memoir of his Astor Company experience records a rather frightening episode from 1812 in which he was accidentally left behind by his north-bound expedition after falling asleep beside a plateau creek. It may have occurred at the Crab Creek crossing, though the record of his journey describes country that makes me think it was more likely Cow Creek where he was left behind. In the 1870s, when Chief Joseph’s Nez Perce made a bid for escape to Canada, a lot of the local settlers suspected that Chief Moses and his men were providing aid to the “renegades.” Moses himself was supposedly implicated in hostile activities, notably in harboring the murderers of a young couple at Rattlesnake Springs south of the Columbia, the Perkins Murders. A posse was assembled to track him down and arrest him. According to A. J. Splawn’s account, Moses’s campfire was visible to the posse when they reached the summit of Saddle Mountain, and he was found in a camp at the crossing of Crab Creek. His surrender and subsequent treatment in Yakima led to a movement to sequester the Sinkiuse Indians to a reservation. Moses resisted being placed on the Yakima Reservation, so the Sinkiuse ended up being sent to the Colville Reservation instead. The land vacated by the Sinkiuse was quickly put into use by white cattle ranchers. 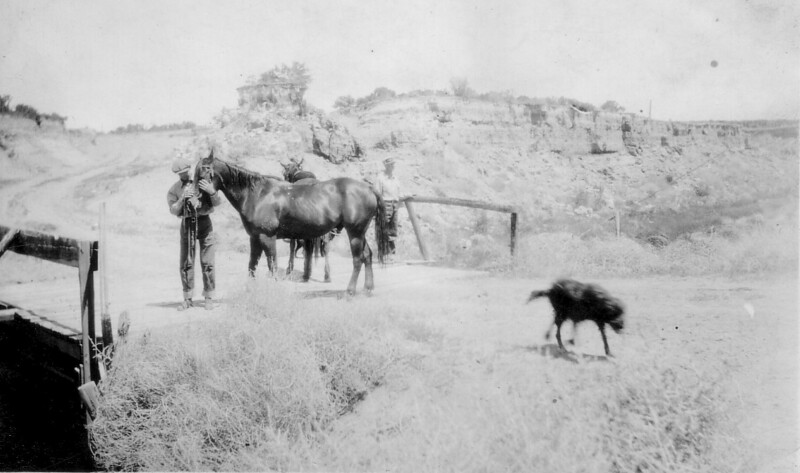 Cattle drink from Crab Creek in this photograph from around 1930, at a location close to the place where today's Highway 26 crosses Crab Creek. 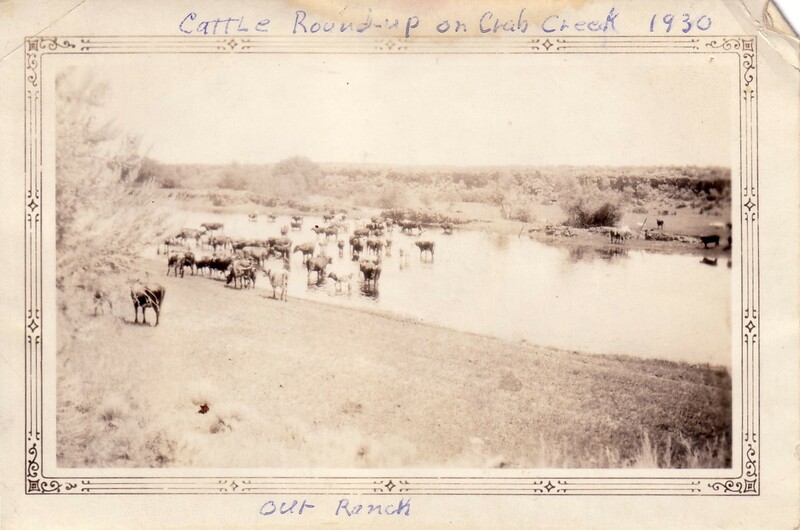 Ranchers moved quickly to establish their herds on Lower Crab Creek. 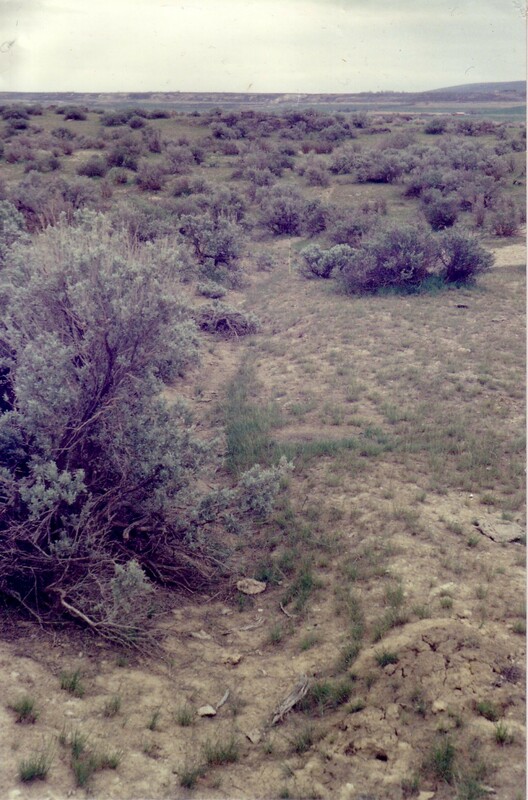 Their rival herds are blamed for overgrazing the native bunchgrass prairies that were described by Army surveyors in the 1850s, and thus allowing the establishment of sagebrush and cheat grass, both of which took advantage of bunchgrass’s near eradication. It is in the 1870s that we begin to find historical references to the area: Ben Hutchinson and his brother Sam worked cattle in the area. Ben’s cabin, built of driftwood logs dragged miles up Crab Creek from the Columbia at present-day Beverly still stands near a treacherous stretch of road called Hutchinson’s Hill. Ben was reportedly 6 feet 10 inches tall, but dwarfed by his brother Sam, who at 7 feet 4 inches tall had a hard time finding a horse he could actually ride. Sam became the sheriff of Yakima County, and Splawn says that’s because he lost a bet in a poker game. My dad claimed to have seen Ben Hutchinson at Corfu when he was a youngster, and he probably didn’t lie. Ben’s grave is located in the Pioneer Cemetery north of Corfu on Frenchman Hill. So trails clearly crossed near where my grandfather’s homestead was later located. One trail followed the course of Crab Creek from the Columbia, and another traced the route from Coyote Rapids or White Bluffs on the Columbia, over the low pass towards the crossing of the creek. Both of these trails seem to have led northwards, past Moses Lake towards Upper Crab Creek and the Grand Coulee country. Some maps identify the Cariboo Trail, which evidently passed through the area. This was the route of a cattle drive from Oregon to gold mines in the Cariboo and Similkameen regions of northern Washington and British Columbia. Splawn describes accompanying a cattle drive to that area in the 1850s, but his route took him north of Ellensburg, over the Manashtash Ridge towards Wenatchee, where he first encountered Chief Moses. The Cariboo Trail evidently tried to follow the Columbia River, but ran into trouble at Saddle Gap, where rugged fields of boulders made it almost impossible to drive cattle through, let alone the wagons that accompanied the drive. Later herds used the low pass route. The low pass is a smooth slope between higher hills on Saddle Mountain, south of the Milwaukee Road substation at Taunton. Evidently this gap provided access to Crab Creek from the south for centuries of migrating Native Americans. Later, wagons found the route amenable. Even today if you investigate, you’ll find the characteristic ruts of wagon trails that lead through and beyond the pass. From the south, the wagon roads angled up slope, over the ridge and down again in lazy switchbacks. Though farmland and orchards obscure the trails beyond the BLM lands today, it seems clear that the wagon trails led towards a gentle slope that trended down to the base of the coulee just west of Taunton. Where the railroad crosses this coulee there used to be a wooden trestle, but now it’s filled in with gravel and rock. When I was in high school I camped out on one of these trails, south of the low pass, with a buddy of mine. We used a metal detector to locate various artifacts: a segment of a broken Model T spring, a side link connector, etc. A 1933 map shows a highway from Taunton through the low pass, heading to the lower end of White Bluffs, where a ferry crossed the Columbia. Branch routes headed east and west from this road. 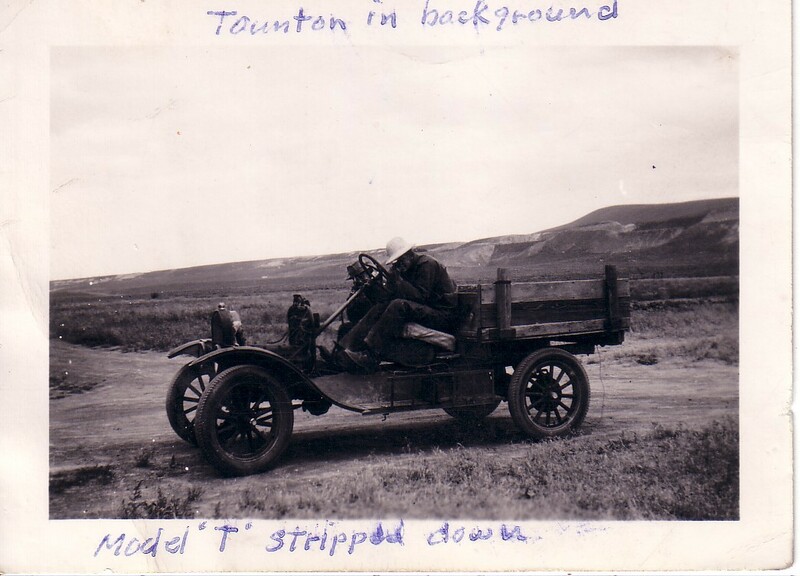 Danielson boys occupy the wreck of a Model T truck in a scene that looks southeastward towards the Milwaukee fills in the coulees west of Taunton. The old trails descended from Saddle Mountain through the coulee closest to Taunton. When the Milwaukee Road was laid out in the early 1900s, Chinese laborers camped along the line. We used to dig up lost coins and pots on our home farm when we were children. The railroad paralleled the route of the Indian trail that led eastward from Beverly, and a wagon road followed the same route. A 1933 map you can find online at the Washington State Archives details the routes of several automobile roads on Lower Crab Creek in the early 1930s. There were five roads leading out of Corfu at that time. One of these was the Corfu Switchback, a treacherous series of switchbacks leading south from the former railroad town, up the steep face of Saddle Mountain and through the Saddle at the western end of the Corfu Slide. This led to a ferry across the Columbia at the upper end of White Bluffs, a settlement known as Wahluke. Portions of the east-west roadway from Corfu are still in use as county roads, as is the road leading due north. Larry and George Danielson and some of their friends clown for the camera on the Corfu highway along the north face of Saddle Mountain in the 1930s. Corfu was linked to Warden by way of the Frenchman Hill road, leading directly north before jogging east. Another road trends northwesterly before crossing Frenchman Hill and heading north to Quincy. 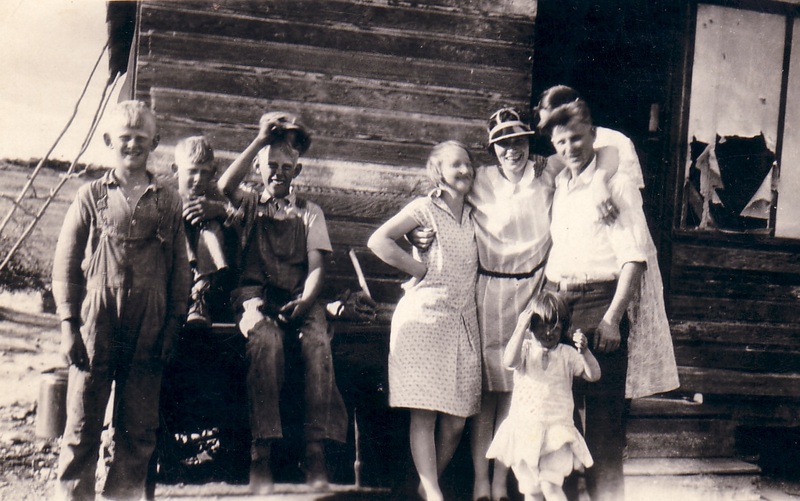 Residents of Lower Crab Creek who wanted to travel to Seattle in the 1930s drove west out of Corfu, following the creek and the railroad, which had to be crossed several times before reaching Beverly. 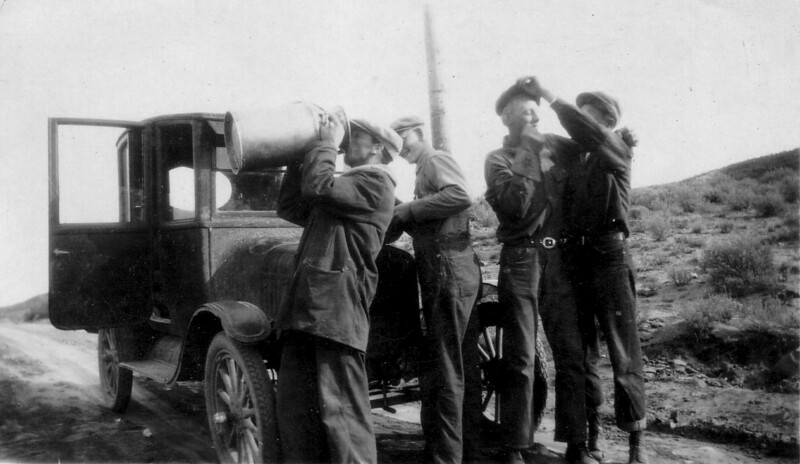 Turning north, the gravel road was frequently swamped by shifting sand dunes as the road followed the Columbia River. Before 1927, travelers crossed the Columbia at Vantage on a tiny ferry. But in that year the first Vantage Bridge was constructed as part of the state highway system. 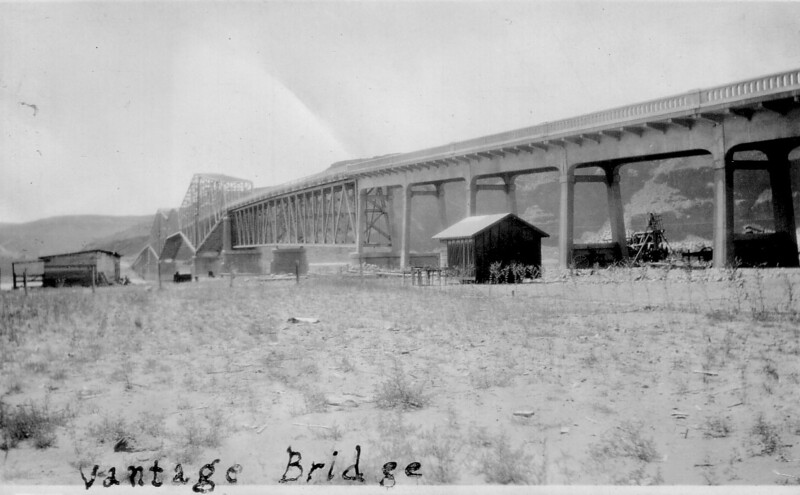 Oscar's camera captured this view of the new Vantage Bridge in the 1930s. In spite of the rugged roads from Vantage to Lower Crab Creek, Oscar’s relatives from Seattle ventured the trip in the late 1920s. The contrast between the fashionable city cousins and Oscar’s ragged family is a stark reminder of how hard it was to make a living on the homestead. Cousins from Seattle visit the homestead, probably in the late 1920s. Curiously, the highway map shows no road directly from Taunton to Othello. It couldn’t have been too long before a road was built, though. My father’s fields lay directly upon an old roadway, and we often found gravel and broken glass where it crossed our farm. Of course, a road to Othello did exist earlier, but it was an ad hoc affair, following twisting coulees or cutting straight across firm soils and sand dunes, with turns when necessary. Such roads crossed the region in every direction, bringing strangers to the homestead every so often. 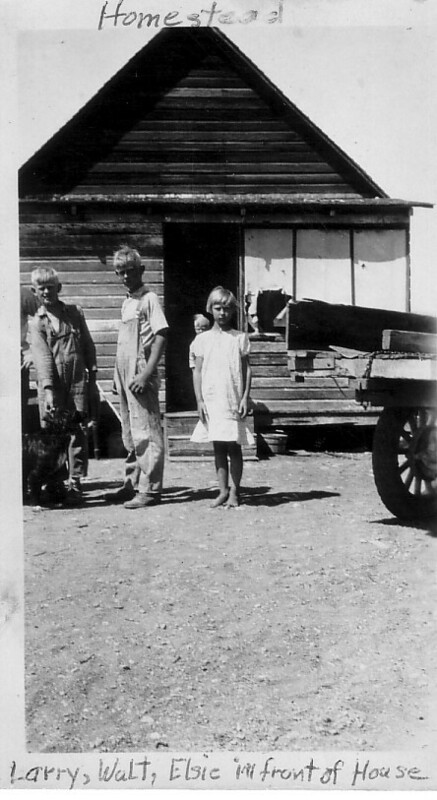 My father reported that migrant laborers bound for Okanogan orchards sometimes camped at their ranch. They were Indians from the Yakima Reservation. But travelers on these back roads were scarce enough to make Edla wary. One hot summer day when Oscar was gone, two men in a truck arrived at the homestead and asked for water. She provided it, but their questions began to make her suspicious: they wanted to know where her husband was and whether the cattle grazing nearby belonged to them. They drove north, but their truck seemed to stop for a while. When Oscar returned, Edla described the event to him. Oscar followed their tire tracks until he found a place where the strangers had stopped to take one of Oscar’s cows. Oscar fetched the sheriff and the two of them continued following the tire tracks west to the Vantage ferry. From there, it was clear the rustlers were headed to Ellensburg. By the time Oscar and sheriff arrived at the slaughter house, the cow had already been dispatched, but Oscar’s D-Bar brand showed clearly on the fresh hide. The rustlers were arrested when they came to collect their pay, spending the next few years in the penitentiary at Walla Walla. This entry was posted in Anthropology, Archaeology, Books, Columbia Basin, Computer, Crab Creek, Family History, Hiking, History, Horses, Ice Age flood, Native Americans, Railroads, Saddle Mountain, Washington, World War II and tagged Andrew Jackson Splawn, Anthropology, Archaeology, Astor Company, Ben Hutchinson, Beverly, Bridge, British Columbia, Bunchgrass, Burke Museum, Canada, Cariboo Trail, Celilo Falls, Central Washington, Cheat Grass, Chief Joseph, Chief Moses, Chinese, Columbia National Wildlife Refuge, Columbia Plateau, Columbia River, Colville Reservation, Corfu, Corfu Slide, Corfu Switchback, Cow Creek, Coyote Rapids, Crab Creek, Culture, Desert, Eastern Washington, Ellensburg, Environment, Family, Family History, Ferry, Frenchman Hill, Grand Coulee, Highway 26, History, Horses, Hutchinson's Hill, Ice Age, Ice Cave, Immigration, Indians, Kamiakin, Low Gap, Manashtash Ridge, Milwaukee Road, Missoula Flood, Model T, Moses Lake, Mount Adams, Nature, Nez Perce, Okanogan, Oregon, Othello, Perkins Murders, Plateau Indians, Quincy, Railroads, Ranchers, Rattlesnake Springs, Ross Cox, Rustlers, Saddle Gap, Saddle Mountain, Sagebrush, Sam Hutchinson, Seattle, Second World War, Sheriff, Similkameen, Sinkiuse, Taunton, Trails, Vantage, Wahluke, Wanapum, Warden, Washington, Washington State, Washington State Archives, Wenatchee, White Bluffs, World War II, Yakima, Yakima County, Yakima River. Bookmark the permalink.